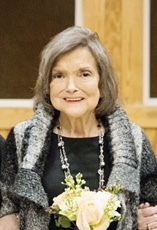 Mary Frances Jones Bottino passed away the evening of February 9th at her home surrounded by her family. She was 72 years old. Born in Louisville, Mississippi on July 31, 1946, Mary was the daughter of Margaret and Golie Jones. She graduated from Louisville High School in 1964 as Valedictorian and attended Hinds Community College. Shortly after, she met and married the love of her life, the late Joseph Carl Bottino. After celebrating 51 years of marriage, Joe was called home to the Lord in 2017. Together, they had three beautiful daughters, and she helped manage her husband’s business, Bottino Contractors, Inc. Throughout her life, Mary’s family filled her home with much love and happiness, especially from her grandchildren and great grandchildren, who adored their “Meme.” Mary was a devout Catholic and a member of Saint Michael Catholic Church. She was a devoted wife, mother, sister, grandmother, and great-grandmother. She loved hosting company, entertaining friends and family, listening to gospel music, and reading books and devotionals. Mrs. Bottino was preceded in death by her husband, Joseph Carl Bottino, her parents, Margaret and Golie Jones, her sister, Martha Tarnabine, and her brother-in-law, Joe Tarnabine, and niece, Amy Phillips. She is survived by her beloved daughters Carla McGehee (Harvey), Christina Kelty (Mark), and Claudia Fridge (Doug), her loving grandchildren Andy Wiles (Sarah), Lauren Ellis (Jeffrey), Mary Alana Collins (Don), Mary Isabelle “Izzie” McGehee, Mason Fridge, Garrett Bottino Fridge, her great-grandchildren Nolan Andrew Wiles and Emilia “Millie” Grace Ellis, her faithful sisters, Ruby Wright (Jerome) and Ann Loyd (Ralph), and many nieces and nephews. She also leaves behind family and friends throughout Mississippi and Louisiana. The Bottino Family would like to thank Angela McCain, Amber English Rice, and Cecille Hesselberg from Kindred at Home; Charlette Miller, Lisa Childress, Yvonne Dee, and Chaplin Jackie Walker —-from Encompass Health Hospice; her loving neighbor, Lisa McCollum; private sitter, Linda Posey; the staff of Merit Health River Region, Dr. Eugene Ferris, Dr. Paul Pierce IV, Dr. Murray Whitaker, Dr. Susan Chiarito, and the members of Hometown Medical for their exceptional care. In addition, they are grateful for the staff at Walnut Hills for their generosity over the years, the loving members of St. Michael Catholic Church, the Ladies of Sodality, Father P. J. Curly, Father Tom Lalor, and Father Robert Dore, along with the Sisters of Mercy, Sister Patricia Parker and Sister Robyn Huser for their continuous prayers and support throughout her life. Arrangements for Mary are scheduled for Wednesday, February 13th. Visitation will be held from 10:00am-12:00pm at Glenwood Funeral Home with mass immediately following at Saint Michael Catholic Church. Father Robert Dore will be officiating. Burial will follow at Greenlawn Gardens Cemetery under the direction of Glenwood Funeral Home. Pallbearers include Harvey McGehee, Mark Kelty, Doug Fridge, Andy Wiles, Pete Tarnabine, Jeffrey Ellis, Don Collins, and Scott Williams. Honorary pallbearers will be Franco Rossi, Warren Guider, Nick Cocilova, Hilton Kalusche, Donny Smith, Jerome Wright, and Ralph Loyd. Memorials may be made to Vicksburg Catholic School and Saint Michael Catholic Church.